Where Will Her Dreams Take Her? As America turns its eyes westward, Carolina Adams finds herself enchanted by an unlikely suitor...the railroad. Frustrated by society's expectations, she longs to study more masculine subjects and is thrilled when her father grants her a tutor. James Baldwin arrives to serve as Carolina's teacher, but of more importance, he is to court Carolina's beautiful older sister, Virginia. Will expectations--and Virginia's southern charm--elicit the hoped-for proposal? Or will James and Carolina dare to acknowledge the mutual interests and feelings growing between them? 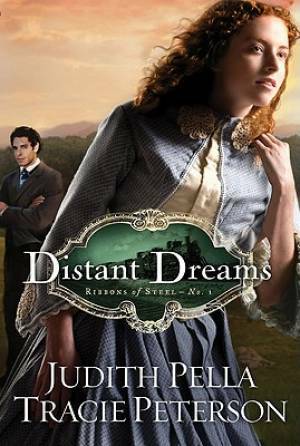 Distant Dreams by Judith Pella; Tracie Peterson was published by Bethany House in September 2009 and is our 36344th best seller. The ISBN for Distant Dreams is 9780764206917. Be the first to review Distant Dreams! Got a question? No problem! Just click here to ask us about Distant Dreams.